If you came of age in the past ten years and don’t belong to a union or come from a family of union members, chances are most of what you’ve heard about these labor organizations has been, on balance, negative. Which helps to explain why as late as a decade ago, two thirds of Americans approved of unions while today, less than half do. Go back to the 1950s and you’ll find three-quarters of Americans liking unions. The membership decline in unions has been as bad. Between 1973 and 2007, for example, the percent of private sector workers in unions declined from nearly a quarter to 7 percent. ||||| It’s often assumed that the U.S. labor movement died a natural death, that it was made obsolete by globalization and technological change. But what really happened is that beginning in the 1970s, corporate America, which had previously had a largely cooperative relationship with unions, in effect declared war on organized labor. Don’t take my word for it; read Business Week, which published an article in 2002 titled How Wal-Mart Keeps Unions at Bay. The article explained that “over the past two decades, Corporate America has perfected its ability to fend off labor groups.” It then described the tactics – some legal, some illegal, all involving a healthy dose of intimidation – that Wal-Mart and other giant firms use to block organizing drives. Then the disastrous Ronald Reagan signed the White House up for the war against unions and it wasn’t long before the corporate media was lending a hand, which has continued right to the present. Washington Post -11 paragraphs in the news section and 27 in the business section. Newspapers used to have labor reporters; they rarely do anymore. Instead even liberal public radio is filled with Marketplace but not a single program offering the other side. And when the House Republicans tried to defund the National Labor Relations Board – a key agency founded by the New Deal – the story got covered by the Wall Street Journal and a few others (Google only lists 5). 176 Republicans had voted to support Policy Committee Chairman Tom Price (R., Ga.), who said that cutting the agency’s funding “can save taxpayer dollars and help protect American job creators from an out-of-control agency.” And most of the media just ignored it. Further there has been a growing separation between union workers and the lifestyle and culture of an increasingly elitist liberal class that was once strongly pro-union but now can hardly get itself involved in basic economic issues. That said, it is also true that unions have done far less than they should have to prevent their own demise. Like every large American institution – from government to universities to non-profits – unions have become self-centered, more responsive to the needs of their leaders than of their constituents, unimaginative, bureaucratic, corporatized and stuck in the mud. And, yes, you can add in corruption. They have failed to adapt to changing economics and culture. For example, they could have used non-union approaches to organize, educate and inspire the growing number of non-union workers, much as the AARP has done with senior citizens, using a combination of social action and social benefits. True, the Wal-Mart employees are not in the union but they won’t even know how to begin without someone leading the way. Traditional unions have failed them. |||| [Ott] has an unexpected and unnerving warning for New York’s more than one million union members. He warns that their wages and living standards will be threatened unless the city’s unions do far more to lift the incomes and living standards of the city’s nonunion working poor, including restaurant workers, supermarket cashiers and taxi drivers. . .
“For a working class that is going to be making minimum wage or slightly above, what’s going to happen is that as taxpayers, that will create a social base for an attack on our own standards.”. . .
Mr. Ott sees two working classes in New York: a unionized one that is doing well and a nonunion one that is struggling to get by. Labor unions have also been largely indifferent to non-traditional relationships such as those of cooperatives, worker ownership, and worker participation at the board level. Too often, labor just seems to be trying to recreate the 1930s all over again. Yet despite such faults and weaknesses, at the end you are left with one indisputable fact: nothing has been invented that has been as successful and positive in representing the needs and rights of workers as labor unions. Nothing. Even the lawyer in Washington or the stock broker on Wall Street should – if both decent and knowledgeable – give considerable thanks to labor unions for their weekends and vacations. – Compensation for workers injured on the job. Further, if you look at the countries with the highest union membership – 57% to 82% in Scananvian countries, for example – you find that only a few – such as Ireland – that also make the list of countries in deep financial trouble. While it would be difficult to draw a strict correlation, it is fair to say that nations that respect their workers are least likely to give the sort of freedom to rip everyone off that the American government has given Wall Street. At the very least, strong union membership exists because of values towards which any decent nation should strive. |||| We all know that unions aren’t as strong as they used to be. But how many of us realize that they are still creating America’s middle class? 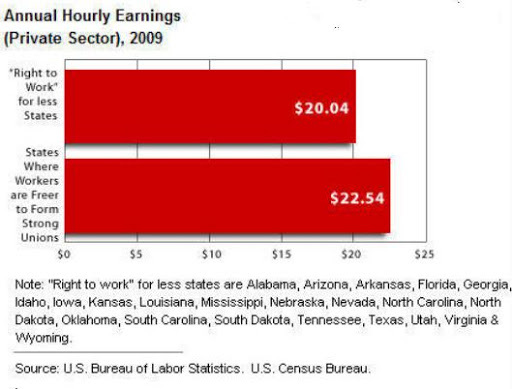 The difference between a union and a non-union job doing exactly the same sort of work averages more than 25%. And for Latinos it’s double that: 50%. This is just a taste of the tangible difference that unions make. The tangible difference is the easiest to measure. But it’s the intangible differences that are the greatest. Without the strength, unity and security that union solidarity provide, everything a working family has is always at risk, even the bonds of family. Parents can work all their lives providing for their children, only to see everything swept away by forces beyond their control. This happened repeatedly to millions of families throughout the 19th century, even though it was a century of fantastic economic growth overall. We have developed an economy in which an extraordinary proportion involves nothing but the manipulation of capital and in which another extraordinary proportion creates that capital without jobs for American workers. Until we revive our respect for labor – and its right to organize, be treated fairly, participate and agitate – then our downhill slide will simply accelerate. A country that invites its CEOs to the White House yet bans its labor unions from bargaining rights has no future.